How early do I need to enroll my child? Is there an enrollment fee? siblings, Avon Nursery School alumni and members of Avon Congregational Church. capacity and your child's age eligibility. There is a $150 enrollment fee. What are the maximum enrollment numbers for each program? 15 children is the maximum per class. Are you nationally accredited? YES! Standards and more than 400 related Accreditation Criteria. What will my child’s schedule be like? 9:00 Check-in / hand washing / teacher-directed activities. 9:45 Bathroom visits / hand washing / snack. 11:15 Outdoor play / large motor / or music & movement. 12:30 Check-in, hand washing, skill-based table activities. 1:30 Hand washing / snack. 1:45 Learning centers / skill-building. 2:45 Outdoor play / large motor / or music & movement. Does my child have to be potty trained? Yes. Can my child and I come in for a visit? Yes. Do you go on field trips? No. related to music or animals. 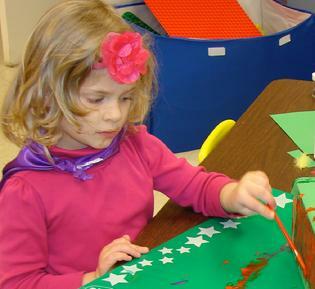 Does Avon Nursery School offer an extended stay option? Yes. dismissal. Lunch Bunch is $10 per day, to be paid weekly or monthly. • 3’s / Tuesdays & Thursdays: Bring lunch. Stay an extra hour. Pick-up at 12:30 p.m.
• 4’s / Wednesdays & Fridays: Bring lunch. Stay an extra hour. Pick-up at 12:30 p.m.
• Pre-K’s and Kindergarten Enrichment / Daily: Bring lunch. Come an hour EARLIER. Drop-off at 11:30 a.m. (No earlier please)! How does religion play a role in ANS? sharing, kindness, courtesy and good manners. Do I need to pack a daily snack for my child? No. Parents sign up on a rotating basis to provide a daily snack for the entire class. and sharing skills. See our “Good to Know” section for recommended snacks.